Workforce participation rates for those over the age of 55 have been climbing over the past few years and are expected to continue growing, according to the Bureau of Labor Statistics. This, according to University of Iowa Public Health Professor Brian Kaskie, is the new normal. “What is the normal retirement age anymore? I don’t know,” Kaskie said during a forum co-hosted by IowaWatch and AARP Iowa in Des Moines on Tuesday. Kathleen Watson, among the panelists at the Nov. 19 Cedar Rapids forum on Navigating the Workplace After 50, discussed tips and advice for those hoping to reenter the workforce later in life. But those with long careers who commanded high salaries and benefits may need to reconsider their expectations, experts on employment over the age of 50 said, as many older workers looking for jobs will face lower salaries and cuts to benefits. Many may also need to shift fields or seek training to update skill sets. 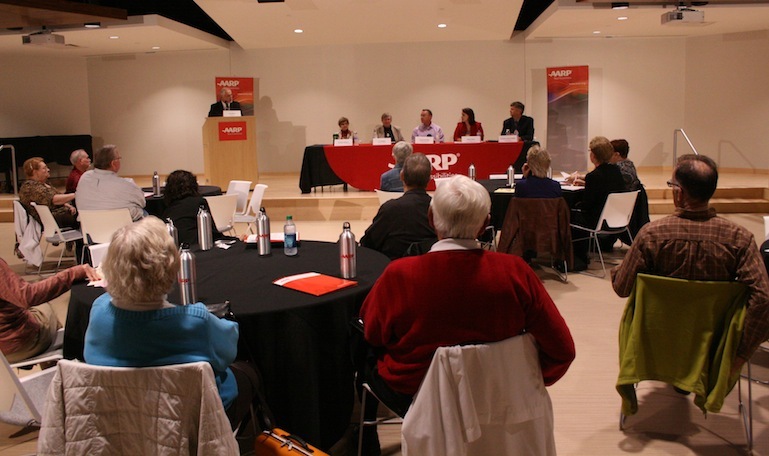 The forum focused on the challenges for those aged 50 or over who are navigating the workplace, including those hoping to re-enter the workforce following retirement or layoffs. It was the first of two forums, with the second held in Cedar Rapids on Thursday. Workers age 55 and over make up 21 percent of workers in Iowa, according to a 2013 report from the Local Employment Dynamics program sponsored by the U.S. Census Bureau. “We need you,” Abbie Olson, director of recruiting and hiring at Hy-Vee, told forum participants. Olson said the company looks less at age and more at whether the individual is a good fit for the job. “The biggest problem we face is not having enough staff. Without those employees we’re not able to take care of our customers,” Olson said. The aging workforce is new territory for employers and those providing training and apprentice programs. Kaskie said older employees bring a host of new challenges for employers including health care needs, like pre-diabetic screening, and the needs of those who are caregivers to parents, friends or spouses. Before, people reached retirement age and they were out, he said. “We all entered into adult life with an idea of what our career would be and figured we’d work and work and work and work and then retire,” he said. For those looking for jobs, some may need training to brush up on computer skills or receiving training. Carlos Vega, an operations manager with Iowa Workforce Development, highlighted workshops to help with job readiness, including training in common programs such as Microsoft Word and Excel. Other programs, such as the Senior Community Services Employment Program, which is organized through the Iowa Department of Aging, help low income, unemployed individuals who are 55 years or older with building up skills through part-time work before going back into the workforce. Rosie Thierer, a workforce specialist with the Iowa Department on Aging, said some people who struggled with finding jobs gained both skills and confidence through the program. “They were afraid to go to work. They were afraid to try. They afraid to even meet people. And they just blossomed because someone there recognizes their skills. When they have the confidence in themselves, they can go back to the businesses or employers and say, ‘I can do this,” Thierer said. 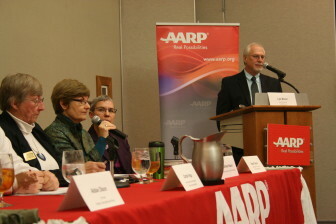 Panelists noted that people looking for a job following a long career might be looking at a pay cut and fewer benefits. High salaries are key targets during layoffs, when high-paying positions are often eliminated. “You need to lay out a compelling reason for why you are willing to accept a salary that is a lot less than what you were receiving before,” Lin Phillips, a Des Moines career counselor, said. She suggested citing a desire for fewer or more flexible hours. 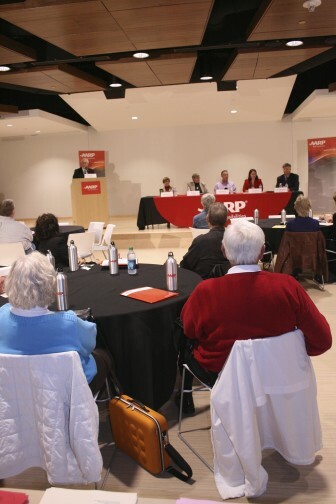 Panelists at the Nov. 17 Des Moines forum on Navigating the Workplace After 50 discussed tips and advice for those hoping to reenter the workforce later in life. Rod Shirk, 65, said he was “retired, but bored,” and his interest in finding post-retirement work drew him to the Des Moines forum. “I have many groups that I am a part of and things I volunteer in, but I would like to get to work again. I miss the excitement and adrenaline rush of having to make something work,” he said. He retired about four years ago following a career in finance administration, including positions as a chief financial officer at mid-sized nonprofits. He said he hoped to find work in his field. “One things I learned today that I had not heard before was that maybe you need to dumb down your resume because you are over-qualified for positions. That is unfortunate, but it is what it is,” he said. Finding work in the same field is not always easy. Kim Wright Jones, 57, lost her job as the AIB College of Business women’s softball coach after the University of Iowa acquired the college and dropped its athletic programs in spring 2015. Wright Jones, who is also a professional graphic designer and has a background in marketing communications, said finding a new job was challenging. “For me to transition right from heading up a softball program back into the workforce, it was a little more difficult for me to find places where people would allow me to actually meet them face to face and allow me to nuance some of my experience,” she said. She said many job applications online have a demographic section and she was always unsure whether, by honestly filling out the section, her age would impact her chances at employment. Panelists noted that age discrimination was illegal and demographic forms are kept separate from applications and used solely to help companies understand the type of applicants reached. However, that may not always be clear to the applicant. “Those generations of work experience and professional life experience add value to the workplace,” she said. Over a quarter of Iowans are overweight.